Nancy's Nook : Happy Feet . . . I couldn't resist putting this picture here. 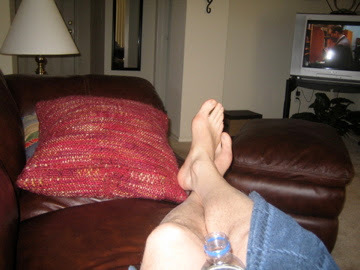 I just read Laura's blog and saw her feet in Venice. Now here are her Dad's feet. The Carmacks must like taking pictures of their feet. I'll see Laura's, as well as the rest of her, in Florence next Monday. I may have to tickle her toes - as my granddaddy used to do to mine. That really made my feet happy feet. Sam may like that, too. Hmm . . .
Well, tomorrow we leave on our big trip. I've stressed enough about what to take - and just packed some stuff that might work. Enough of being a perfectionist!! ENOUGH, I SAY!!!! Enough!! So what if you don't take just the right stuff. oh - it's a rhyme. The feet aren't quite as happy looking as in Laura's post. I think those (Laura's) are the happiest feet I've ever seen.